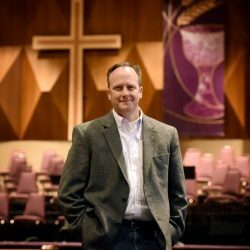 T. Scott Daniels is senior pastor at Nampa College Church of the Nazarene. Scott has also pastored in Pasadena, California and Richardson, Texas and until recently served as the dean of School of Theology at Azusa Pacific University. He is a frequent guest speaker and lecturer at churches, camp meetings, and college campuses. He received his BA from Northwest Nazarene University and his MDiv and PhD in theology and ethics from Fuller Theological Seminary. Scott has taught at several colleges and seminaries, nationally and internationally. He has served as a fulltime professor of theology and ethics at Southern Nazarene University and Azusa Pacific University. A contributor to several books, journals, and magazines, he is the author of The First 100 Days: A Pastor’s Guide; Seven Deadly Spirits: The Message of Revelation’s Letters for Today’s Church; and The Cycle of Victorious Living: Commit, Trust, Delight and Rest in Jesus Christ. Scott and Debbie Daniels have been married for 26 years and have four children: Caleb (22), Noah (19), Jonah (16), and Sophie (13).